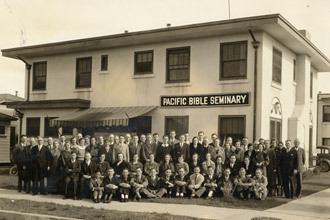 Hope International University is a private Christian university identified with non-denominational Christian Churches/Churches of Christ and founded on October 9, 1928, as Pacific Bible Seminary. Today, the University is composed of five Colleges including College of Arts & Sciences, College of Business & Management, College of Education, Pacific Christian College of Ministry & Biblical Studies, and College of Psychology & Counseling. Within the Colleges are programs for traditional undergraduate students, online students, and graduate students. For a more detailed historical overview, click here. The distinctive about this Christian church is that it has no distinctive. In fact we deliberately seek not to be different, because our goal is unity, not division.